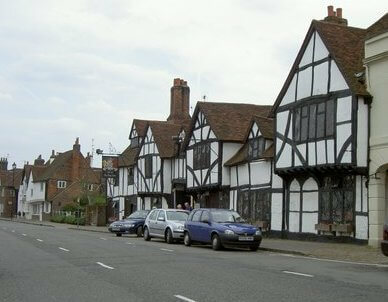 Amersham is typical of an old coaching town with a wide main road, inns with high archways for the horses and coaches to go through to the cobbled yard behind. An ostler would have been at the inn to change the horses while the passengers had some refreshment. A few of the inns were ‘Posting houses’ where horses to pull private coaches would be hired out and then changed at similar inns at the next large town. The Kings Arms, The Crown and The Griffin were Posting houses. In 1637, 33 stage coach services per week were passing through the town. The earliest references to the Kings Arms appears in the Quarter Sessions Records of 1756, which refers to licences granted to innkeepers. From 1756-62 the licence was held by James Wilson; 1767-8 by Francis Purdames; and 1772-81 by John Cook. A map of Amersham dated 1742 shows the property belonged to a Mr Wingfield. It was originally two separate timber-framed 15th century hall houses either side of the covered entrance to the inn yard. Looking at the front of the building, it was the part on the left that was re-fronted in 1936 using some of the old timbers – some people refer to it as “Brewer’s Tudor”. E B Musman was the architect. The part on the right has its original frontage and only became part of the inn in the 1930s. One can see the original old timbers on the sides of the building and inside there is a lot of the original 16th and 17th century structure. The King’s Arms was built in the 16th century of brick and timber (now much altered), the roof is tiled and the front modern with a large gateway at the western end heightened in the 18th century to admit stage coaches. At the back there are three gables and at the southern end there is a short gabled wing. A room on the ground floor has an original moulded ceiling beam. The stable at the back of the building is probably also 16th century. The building to the right was built in the 15th century, enlarged in the 16th century, and again in the 17th and 19th centuries, built of timber frames with brick filling covered with plaster. It has been partly restored with modern brick. The roof shows two bays exposed to an open hearth and one bay free of soot as a result of a closed truss. This suggests that the structure was originally a 15th century open hall with a chamber block on the western end of the building. The floor boards are 17-18th century. The rafters at the front of the building were replaced in the 20th century. During the 16th century upper floors and a brick chimney were inserted. The longitudinal beam has double hollow mouldings typical of the later 15th century. During the 18th century a dog leg staircase was inserted with Tuscan columns balusters on squared blocks. At the western end another 18th century staircase has been inserted. The timber framed cross-wing on the eastern side is of later date than the original 15th century open hall, with the roof suggesting a 16th century building date with 18th century conversion. Wall paintings were discovered in 1931 during restoration and recorded by Francis Reader. Remains of floral design (see below) painted in purple on a black background were found on the sloping ceiling under the roof of the hall. On the south face of the upper floor partition wall of the west wing traces of a decorative scheme of two one inch wide bands of black and red bordering the plaster panels and probably originally carried around the other walls of the room. On the north side of the same partition a portion of painted frieze was found with white arabesque-style decoration on a black background, including a central basket of foliage flanked on each side by swans and a dolphin. The tie beam above the frieze had been painted white with black horizontal and cabled bands. Beneath the frieze, traces of black and white strap work decoration survived on some of the wall timbers. This window frame was moved from its original location in the King’s Arms pub around eighty years ago. The house that it was built for was a Tudor hall house on the High Street. The timber window frame was designed to be part of an external wall, however it was moved inside as an internal screen, possibly explaining to why the window frame is in such a well preserved condition. The existence of this timber-framed window suggests that there were good quality hall houses on both sides of the High Street during Tudor times and that Amersham had flourished by the late 15th century. There are two reports on surveys carried out by Thames Valley Archaeological Services in 2001 on the building and on the archaeology. See below the photo gallery for information on names and dates of the occupiers and owners. 1894 Kings Arms, Amersham, bought by Weller from Salter & Co.